I just started reading The Cost of Discipleship, by Dietrich Bonhoeffer. I knew the bare outlines of his life and death, but the edition I have had a great foreword documenting Bonhoeffer’s life and beliefs. Obviously, there was much about his principled and faith-filled stand against Hitler, the Nazis, and consequently, his own country. This knowledge coincided this week with the visit of Donald Trump here to Tulsa, appearing at Oral Roberts University with Sarah Palin in tow yesterday. To me, Trump’s candidacy and the following he has inspired over the last year is positively fascist in its outlook, rhetoric, and goals. Now, I don’t mean to say this for reasons of provocation, nor do I mean to intimate that I believe Trump supporters are fascists or Nazis. Far from it. I think the infatuation with Trump, and more specifically, with the message he is spreading, is appealing to a demographic that is feeling threatened and frustrated with the trajectory of America in the Obama era. 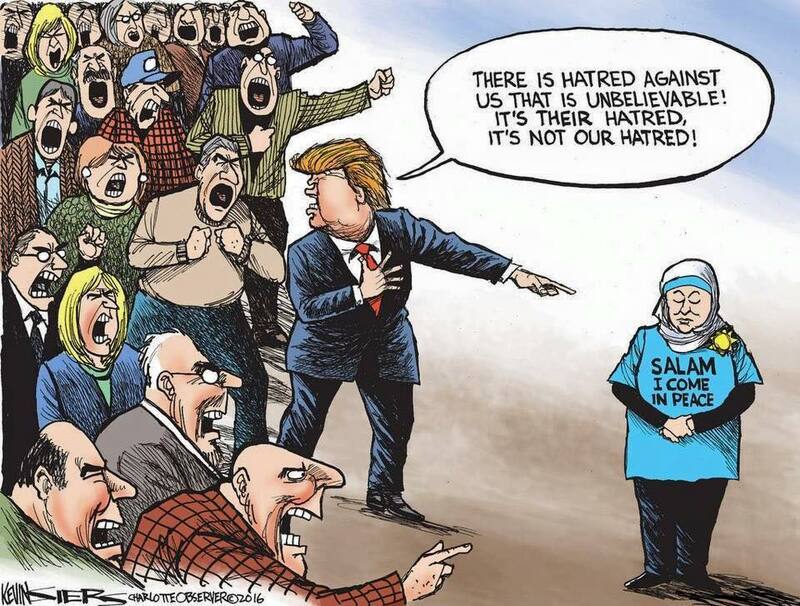 Trump supporters are no more responsible for his hate and bigotry than average Germans were responsible for the actions of the Nazi Party seventy years ago. I also know the perils of comparing anybody to Hitler or Nazis, and as former political operative and ongoing politics and history junkie, I fully understand the weight of such an allusion. But it is one I fully intend to make. One of the actions that inspired this line of thinking from me was Trump’s new ploy of calling out and tossing protestors from his appearances, and specifically, tossing visible Muslims. Especially striking was the taunting and hate directed several weeks ago against a hijabi who was silently standing in protest against Trump. This video, this whole thing, makes my very soul ache. I have seen few sadder things. I can’t even express the deep level of genuine anguish and sadness this makes me feel as I just think about it, without even having to watch the video again. I can’t watch it again. Is this where we are America? Is this what animates us, what gets us excited and into the political arena? Pure, unadulterated hate towards a group of peaceful people, towards our fellow human beings? Over the past months, as a result of the hate emanating from swathes of America, I have had the beautiful opportunity to get to know the Muslim community in Tulsa. I have made good friends, and send beautiful acts of love and tolerance towards people of different beliefs. Some of my friends look strikingly like this woman who Trump targeted. It makes me so sad to picture my friends in that place. It makes me so sad to think about what they must be feeling, as they go about their normal American lives, at the grocery store or the mall or the gas station or in their place of worship or at their child’s school, in constant fear that they will the target of hateful words, or possibly even worse. In a few weeks, I have the opportunity to sit on a panel at the Muslim Day at the Oklahoma Capital. I greatly look forward to the whole event, and to interacting with amazing people. But I dread the hate and bigotry I will be witness to from my fellow Oklahomans. I fear for the safety of my friends, their physical safety and their psychological safety. I don’t want to see them hurt, but I know I will see it, because people can’t control their hate and their fear. And I hold Donald Trump responsible right now. I hold his campaign, and the whole twisted premise of it responsible. He is not the first to act this way; he is certainly part of a political party full of power-hungry individuals who view the degradation of Muslim men and women, and the fear they stir up, as effective electoral strategies. It is sickening that an entire party has seized on such a tactic. But Donald Trump is in effect the standard bearer of the Republican Party in 2016, and certainly the standard bearer for right wing hate, and so he is responsible for this moment in American life. Trump is appealing to people because of their feelings of alienation and disempowerment. His supporters are chiefly white, middle class, and with lower levels of education. This demographic feels like the America they are living in is one they no longer recognize. They feel that the growing diversity and calls for inclusive spaces and speech are aimed at them. They feel that the benefits of being American no longer are reserved chiefly for them, but are instead being bestowed upon minority groups. And by and large, they are right about these things. America is increasingly less white and less Christian. The edifice of white supremacy is being torn down bit by bit, and like a cornered animal, it is fighting back harder than ever. It is almost assuredly a losing fight, but it won’t be conquered quietly. So, just like the mass of German citizens who felt their nation was being humiliated and marginalized, and this turned to a leader who promised to “make Germany great again,” so this class of Americans are turning to a man who scratches an itch for them. The fact that Donald Trump almost assuredly doesn’t believe the things he says, deep down, makes it that much worse, and that much scarier. Trump has a 30+ year public record, and this tone and attitude has just come out in the last couple of years. If he is nothing else, Trump has an amazing ability to discern what it is the America public wants to hear, and to give it to them. That’s what makes this whole thing so crazy: it’s not that Trump has burst onto the scene with a previously formed worldview, that he is now dressing up in patriotism to win supporters; instead, he is tapping into the sentiment of public discontent, and telling the people what they, deep down, want to say themselves. A deeply committed fascist is bad enough; an opportunistic, pandering barometer of public sentiment who has seized upon fascism because it fits the national mood is a whole other, terrifying animal. I started this talking about Dietrich Bonhoeffer and his opposition to Nazism in Germany, and I want to circle back to that. I have no idea what is was like to live in that time or place. I don’t want to insinuate that we are on the brink of anything as earth-shatteringly awful as the Holocaust. But I imagine that the climate we see towards Muslims as a result of Trump is very similar to what Jews experienced in Germany in the ‘30s and ‘40s. This is the chief reason why I attribute the title “fascist” to the Trump campaign. Fascism is primarily distinguished by nationalism, a militant/masculine tone, social conservatism, and the scapegoating of political, religious and ethnic minorities. Who can deny that those are key features of the Trump movement? Dietrich Bonhoeffer is a hero and martyr because he stood strong in his convictions, even in the face of horrendous death. Not only that, but he did it in opposition to his nation and heritage. Bonhoeffer was a proud German, and the fact that he, in effect, took the position of advocating for his own nation’s defeat in a world war, for the sake of the human race, is an amazing testimony. The prevailing Christian attitude in America is a weird amalgam of two seemingly opposing worldviews, one that embraces a religious nationalism that has equated America with Christianity, and one that tries to show how “non-worldly” it is, that revels in the idea of being “not of this world,” and that constantly laments the sinfulness of American society. We are a people who complain about the commercialization of American society while we walk through megamalls loading up on all the stuff we can. Bonhoeffer showed us a different a way. He was a man who was proud of the nation and people he came from, who despite it’s shortcomings, loved Germany and took pride in his identification as a German. And at the same time, understood that, as a Christian, he had a higher allegiance, not just to God, but to humanity as a whole, to the entire Earth. Thus, when his nation became a menace to that very humanity, he didn’t public lament it’s descent into madness while failing to back up his ideas with his actions. He stood against his nation, it’s leaders and his fellow citizens in the name of love and justice and grace. He recognized that demonizing others isn’t the way to restore a nation. He was the quintessential Christian of the 20th century, and amazing example for all those who strive to exist in modern society while practicing the loving, others-oriented Way of Jesus. It is for these very reasons that I wrote months ago that one cannot be both an honest Christian and a Trump supporter. I got a lot of pushback for that statement, but I stand by it as much now as I did then, if not more. The actions of Donald Trump and his supporters towards our Muslim brothers and sisters are despicable and heartbreaking. They reveal a deep-seeded, extreme nationalist, bigoted streak of pseudo-fascism that has long existed deep in the American psyche, and is bursting forth like never before. We have a Christian obligation to stand against this attitude, to stand with our brothers and sisters, even if they have a different religion or ethnicity or skin color. We have a duty to be an army of Dietrich Bonhoeffers in the face of ugly fascism, acting with humility and love and a steadfast regard for the oppressed and beaten down. That is what the cost of discipleship looks like. That is what it means to be a follower of the Way of Christ today. An interesting read that ties DB with “The Donald”! I agree with this view of Trump supporters as fearful people wishing to be rescued from change/their unknown. Trump is also unprincipled and opportunistic. I question, however, whether this attitude is foreign to Donald Trump. After reading the description of his father, Fred Trump, the Donald is on familiar ground. Hi Mary, thanks for reading and taking the time to reply. I’ve seen the stuff about Fred Trump floating around on Facebook this week. To just clarify, my point about Donald isn’t that he is a closet liberal or anything. What I mean is, I don’t think he has any strongly-formed convictions and principles, especially when it comes to politics. His father’s nature may have primed him for his current iteration, but I think he is the kind of person who will do or say anything for the sake of money and attention. And so now, he has seized on this fascist tone and policies because it is working, because it has propelled him to the top of the polls and filled arenas with supporters. But based on his 30+ years of public statements, unless he has had a major character shift in the last couple of years, I just have a hard time believing it to be authentic. I’m not sure if Trump believes his own rhetoric. But Cruz scares me more – he’s smarter, he’s savvier, and he really does believe what he says. He’s the real face of evil. Yeah, I think Cruz is pretty scary as well. He is very extreme. Luckily, I don’t think he will be the nominee either; he is much to disliked by Republican party actors who are the biggest influence on the outcome of a primary race. Are political meetings like this public gatherings? If they are open to all, is it actually legal to force someone to leave if they are behaving themselves and not causing a disturbance? I don’t think this sort of expulsion would be permitted in the UK. I’m not sure. I don’t think things like this are considered “public” events in the same way sporting events are. In any case, it’s highly unlikely any government entity would go after a political campaign for something like this; the political fallout would be unthinkable. I don’t believe your allusion to fascism is off the mark. We think automatically of Nazi’s and Hitler when we think of fascism, but that is one iteration of fascism, not fascism itself. I’ve thought for some time that Mr. Trump and his supporters are neo-fascist; please understand that you are not alone in your conclusions. Pax! Thanks for reading, and for the support! Read a good history on the rise of the Nazis in the 20’s and 30’s and the parallels with that and the tea party are extremely frightening. Both Cruz and Trump are examples of the apocryphal quote from Sinclair Lewis: when Fascism comes to America it will come wrapped in the flag and waving a cross,” possibly attributed to Sinclair Lewis or Huey Long. The quote is from Sinclair Lewis’ book, “It Can’t Happen Here,” which depicts, of course, fascism happening here. Read a good history on the rise of the Nazis in the 20’s and 30’s and the parallels with that and the tea party are extremely frightening. Both Cruz and Trump are examples of the apocryphal quote from Sinclair Lewis: when Fascism comes to America it will come wrapped in the flag and waving a cross. Brilliant piece. Its scary how high in the polls he has risen. I am Canadian. I am carefully but fearfully watching this unfold. Select an identifiable group. Blame all the woes of your country (world) on them. Create fear and hate. Fan those. Rise to power. Yes you can attach some level of ownership of Hitler’s rise to power to the common German citizen. For the good man (person) to fail to reject Evil is all Evil needs to triumph. History will record the failure of the American common person to reject Trump and rightfully assign the blame for the horrible outcomes. I’m not a Trump supporter but I’m a proud republican who strongly disagrees with your assumptions regarding the average Christian American. First of all our fear of Muslims is really a fear of ISIS and the Taliban. Very few Americans actually hold the whole religion responsible for the actions of a few religious zealots. The problem is that Trump is the only nominee saying things that go against the liberal way of thinking ie political correctness. You are correct that every year this country becomes less white and less Christian but it is still overwhelmingly white Christians who are held responsible for all the evils of this country. We need political leaders who are willing to fix the problems of this country without worrying about upsetting a few liberals. Trump is getting Christian support because he’s the only one not apologizing for Christian values. Until America fixes our problems with homelessness, unemployment, and mental health we can’t afford to take on the world’s problems. Ephesians 2:8~9 8For by grace you have been saved through faith; and that not of yourselves, it is the gift of God; 9not as a result of works, so that no one may boast. This is another reason why I believe Mr. Trump does not have the heart of God. His heart does not speak like it is inspired by the Lord. Here is how God expects us to treat our neighbor. 31“When the Son of Man comes in his glory, and all the angels with him, he will sit on his glorious throne. 32All the nations will be gathered before him, and he will separate the people one from another as a shepherd separates the sheep from the goats. 33He will put the sheep on his right and the goats on his left. Denise, thanks for taking the time to read and comment. I don’t think I’ve gotten my reading of the average American Christian very off. If, as you say, the real fear is ISIS and the Taliban, then why do so many support policies that would seem to target all Muslims, including those who are American citizens. As for your second point, I think whites are held responsible because it is mostly us who are still holding the levers of power in America, whether that be political or economic or religious. You say you want our country to fix “our problems with homelessness, unemployment, and mental health.” But yet your professed political party consistently is the one that stands in the way of any of these problems being fixed systemically. Why do you identify with a party that is seemingly opposed to any and all ideas to fix the problems you want to see fixed? Your statement that we need to “fix the problems of this country without worrying about upsetting a few liberals” is I think a perfect example of what is wrong with political discourse in general, and especially is evident in the modern Republican Party that embraces and supports people like Trump and Ben Carson and Ted Cruz. There is considerably more excitement in the idea of offending a few liberals than there is in governing effectively in a democracy. Until that attitude it jettisoned, none of the problems you identified will ever be fixed. It is like saying every child should have candy before bedtime. Well yes it might taste good but over time it will rot your teeth. He takes statements that everyone agrees with such as “Anyone working 40 hours a week should make a living wage.” But like Trump saying, “Make America Great Again.” the methodology is all wrong. If you compare the two, Trump is a greater threat with the fascist ideals he promotes and backwards thinking. Bernie has good ideas, just he’s going about the wrong way to solve the problem that is probably because he has more experience as a lawyer than helping business grow so they create more jobs. Thanks for posting this! I wrote a play about Bonhoeffer which premiered in Louisville, Ky. last April. He was an amazing man and given the amount of research I did, there is no doubt in my mind that the Trump correlation is spot on. I think Dietrich would be appalled to see what is happening here in America. Dietrich would be appalled. Appalled that his fellow Europeans have permitted another fascist system of thought to invade Europe so soon after they had such a bad experience the first time around. The dear lady that you speak of above in green/blue has been identified as a CAIR organizer – an organization that some Muslim and our country have identified as a terrorist organization. Have any of you read or listened to the objectives of Islam? Please read The Story of Islam. It is $.99 on Kindle and I’ll even spot you the $1 if you like. What is driving the fear is the mass migration of people representing the biggest collection of bad ideas the world knows – the Koran. Donald is the same Donald that never polled out of the single digits in past elections – the difference is fear in the electorate. That the public is this fearful, is what should be giving you all pause – not the Donald. Thank Juergen! Can you share a link to your play here? Justin, please explain your meaning og “honest Christian.” I’m asking for my brother who took offense at my reposting this piece, and of all that it said, he found used on that. Can you help me out? Well said, and I completely agree. We make a mistake when we simply equate fascism with Hitler and the Nazi’s. They were just one iteration, not the singular definition. What we see in the US is the rise of fascism, but what’s more, we are seeing right-wing authoritarianism across much of western society – it is a much a growing problem in Europe as it is in the US. (Look to The Guardian for such reporting.) That said, I think it is prophetic to call out Mr. Trump and his supporters for the faux-christian values for what they are: not christian, but fascist. I really appreciate this article, and I posted it on my facebook page. Marshall – very well stated. Justin is clearly not on the side of the principled men of the past that have protected truth. He has fallen into the desire to please everyone and has thus betrayed truth.